I was lucky to happen upon the Rirkrit Tiravanija and Gordon Matta-Clark exhibit at the David Zwirner gallery this past Wednesday. The exhibit is a posthumous collaboration (at least for Matta-Clark) wherein Rirkrit pays homage to Matta-Clarks’ “FOOD” restaurant installation originally at 112 Greene Street in Soho, 1972. Rirkrits’ work “Untitled (Free)”, was originally executed in 1992 and has been recreated in the 19th street gallery space. The food is provided to anyone who wants to partake, and is a thai dish, with tofu, eggplant, bamboo shoots, creamy coconut sauce and some undetermined “fish sauce” used for flavoring. I was at first mortified by the look of the bubbling creamy mixture. I walked through the raw wooden space, stepped over nails, watched the video in the back room and then reconsidered the food. I realized the sense of passing time. The thought of the project evolving from 1972 to 1992 and now 2007. I felt that the only thing I could do as a contemporary artist, was to pull up a plastic chair, grab some chop sticks, a spoon full of rice, and get to eating. 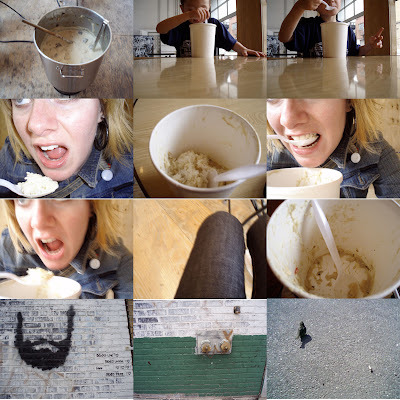 I documented my experience (complete with a young boy who sat at the table with me) below. Yum!